A fledgling idea, born during an airport layover and cultivated with the help of Colgate’s Thought Into Action Entrepreneurship Incubator, has landed a recent alumnus on the two-hour season premiere of ABC’s Shark Tank, Sunday, October 1, at 8 p.m. While a press embargo restricts what exactly happened when Ryan Diew ’17 plunged into the tank to ask for funding from America’s most beloved — and sometimes reviled — venture capitalists, he promises the appearance is one to remember. “I think they liked the idea, they liked my hustle, and they liked my grit,” said Diew, who graduated with a degree in computer science and played Division I basketball while at Colgate. Diew said he expects to appear during the show’s second hour. 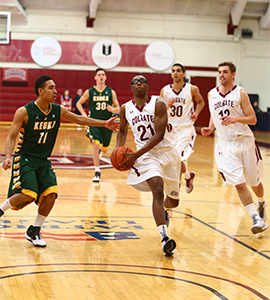 Ryan Diew ’17 on the court. Diew came up with his business, a phone app called Trippie, when he was a sophomore traveling from Colgate to his home in Oakland, Calif. During a long layover, he wanted to grab some food, but he also didn’t want to lug all of his carry-on baggage through the airport. So, he let a stranger watch his bags. He also didn’t want his quest for food to result in a missed flight. He thought there had to be a better way. So, he invented one. Trippie wasn’t always about helping travelers quickly locate food or stores in airports. When he first brought his idea to the TIA incubator, Diew was hoping to develop an airport food delivery app. Diew taught himself how to code Swift, one of the most popular app development languages, and he has worked to refine the product ever since. He also worked with former Colgate student Samantha Braver, and the two pitched Trippie at the 2016 Entrepreneur Weekend, where they took way more than $22,000 in funding. Braver later left Trippie for a job at Apple. 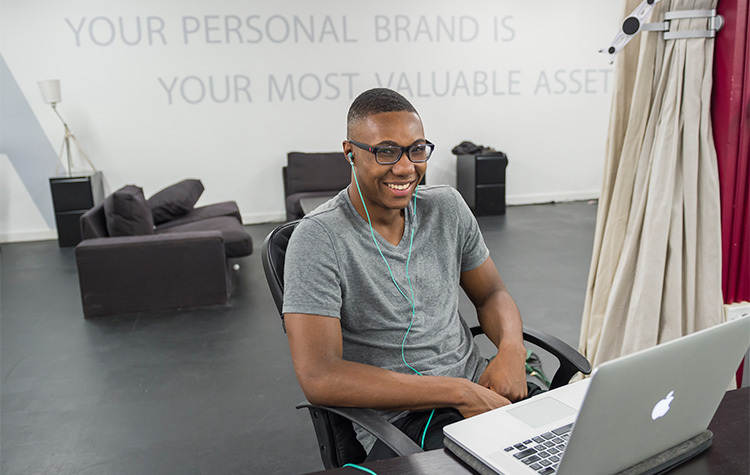 In 2017, Trippie was selected as an Entrepreneurs Fund recipient, which gave Diew $15,000 toward his venture and workspace in the downtown Hamilton incubator to work full time on his product. He was contacted for the Shark Tank opportunity after his business appeared in an Inc.com Coolest College Startup competition.